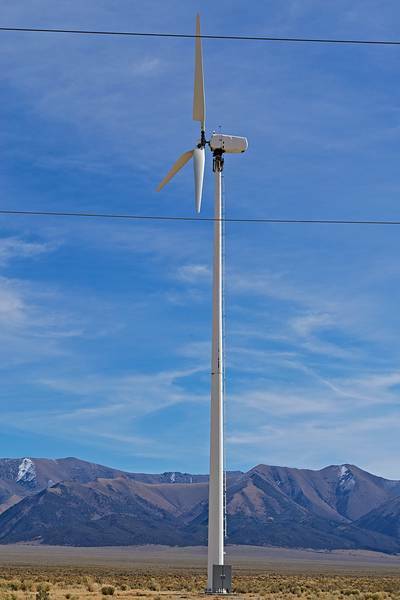 Renewable energy and electric vehicle fan Bob Tregilus was out and about in rural Nevada when he came across an odd wind turbine powering a well pump in the Reese River Valley. So he sent along his photos of a rebuilt USW 56-100s in the wild. There were some 4,000 US Windpower 56-100 turbines operating in California during the late 1980s and through the 1990s. Many, if not all, have been removed in large-scale repowering projects. The turbines show up occasionally on the rebuilt-reconditioned market. At one time a French utility was considering installing some in New Caledonia despite--my admonitions. Bob has previously sent photos of some used USW 56-100s he's found in Nevada. See New Pics of Old USW 56-100 Wind Turbines. His new photos show an unusual installation of the old 56-100 on a tubular tower. 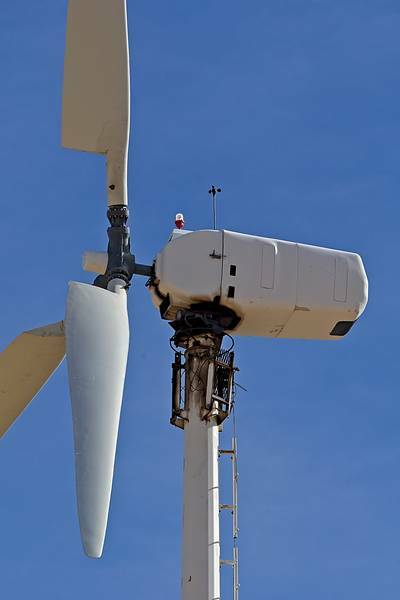 The 56-100, so named because its rotor is 56 feet (17 meters) in diameter with a generator rated at 100 kW, was nearly always installed on a tripod lattice tower. Note that this unit has an obstruction marker light on the nacelle and the tower sports an ugly set of cell phone repeaters. The turbines are free yaw and operate downwind of the tower. Overspeed protection is provided by feathering the blades as seen here.